From my personal interest in international and community development, I have been working alongside the local women in rural Kenya. I believe that women play a significant role in community development. In order to achieve the Sustainable Development Goals (SDG’s) and live in a free poverty world, women need to be engaged and empowered through any form of human development. Three years ago, my family started a non-profit organization, GLOW Foundation, which focuses on eradicating poverty in Kenya. GLOW Foundation has been working towards its goals by ensuring that the local communities in Kenya have enough water for the domestic use and for the animals. In the Summer of 2018, GLOW Foundation partnered with Eastern Mennonite University (EMU) to address the issue of water in the village of Kyangala. 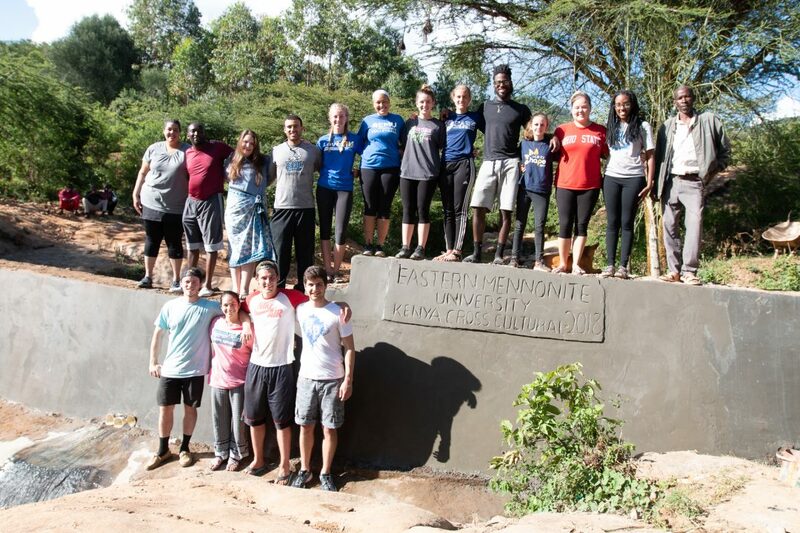 With fourteen other students from EMU, we traveled to Kenya where we spent three weeks constructing a sand dam. The sand dam will control the soil erosion, raise the water table, and allow women to not walk a long distance looking for water. We are hoping that the sand dam will impact the society in three different ways: socially, economically, and politically. Socially, the children will not spend most of their time looking for water, rather they will spend their time in school or working on school work. The children will not miss school to look for water, and therefore their academic performance will significantly improve. Economically, women will have enough water to practice small-scale farming with the help of irrigation. Therefore, they will become more economically independent. Additionally, locals will not be forced to sell their livestock at a cheaper price during the dry season. The sand-dam project will strengthen the relationship between the community members because there will be no water-associated conflicts which will emerge during the dry season. Politically, it is the role of the state to provide public utilities, such as water, roads, and education, to its citizen. Due to the government’s failure in providing such utilities, GLOW Foundation has stepped in to pick the slack. After the implementation of sustainable projects by NGOs, such as the sand dam, the state will begin to see the importance and impact of such projects. Therefore, the government may allocate more funds to community development projects. In conclusion, the sand dam project was greatly appreciated by the locals. For decades, water has been a scarce commodity in the village of Kyangala. On behalf of GLOW Foundation, we are so grateful for Eastern Mennonite University as they helped to fund the sand dam project and equip us with the student volunteers. Felix Kioko is currently pursuing his MA in Conflict Transformation at The Center for Justice and Peacebuilding, having recently graduated from the Peacebuilding and Development (PXD) program at EMU. He plans to work with Global Development projects after he graduates in the Spring of 2019. Photos by Christy Kaufman.